The rain was steady in Harper’s Ferry and the valley swelled with fog. I ran with all my equipment into the parish hall behind the landmark church wondering what the mood would be. I usually get to meet my brides and grooms before their wedding day on a initial meeting and engagement session, but I had only spoke with Anna and Thomas over the phone. To be honest, I had a few butterflies. But when Anna arrived she was calm and focused on preparing for the mass and her demeanor was contagious. She remarked that the rain was actually kind of soothing. I stopped shooting for a moment, breathed in the drizzle, and saw how beautiful Harper’s Ferry looked through the veil of quiet rain. Anna and Thomas are those kind of people. Focused on the right things, unswayed by temporal distraction, and a positive influence on those around them. Their wedding celebration, a Latin Mass, sung by an incredible choir and officiated by a talented priest and singer, was 100% them. As a Catholic myself, I have to tell you, this past year or two has been somewhat challenging to the faithful. My local parish, my diocese, and my worldwide church has been let down by some of the men entrusted to shepherd us. 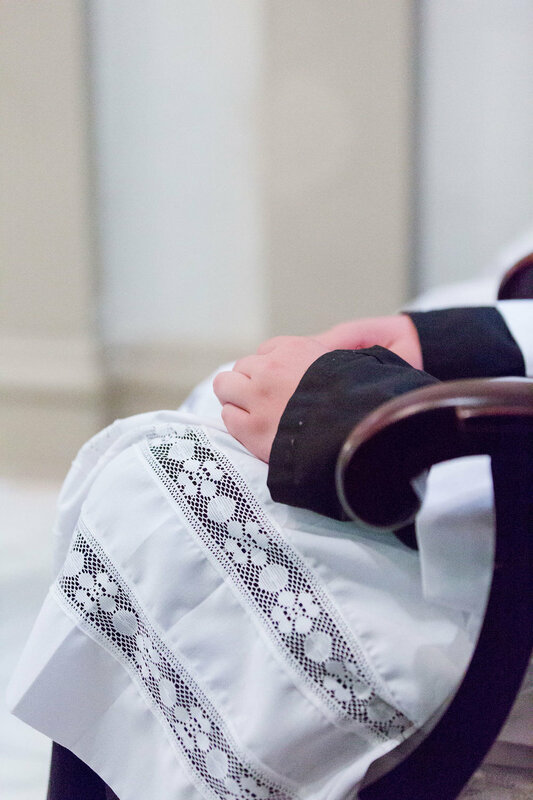 The ritual of Anna and Thomas’s mass was one of beauty. 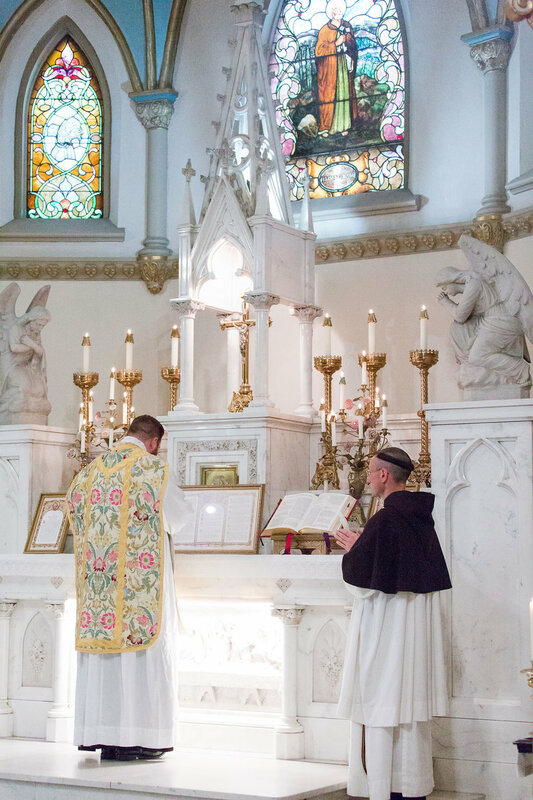 The white marble altar, stained glass windows, and gleaming gold chalice, all moving aesthetics. 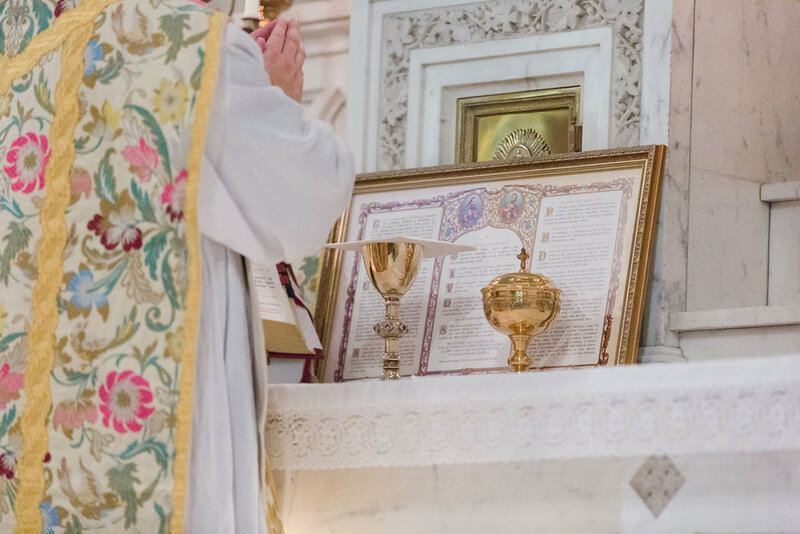 But the true beauty was found in the people making a vow to each other and with God at the forefront fo their commitment, in the prayers, readings, songs, and communion. It’s these moments, these acts of faith, that sustain me. Thank you to Anna and Thomas for inviting me to be a part of your celebration. You set out to begin your marriage with an act of witness, and succeeded greatly. It was a joy to be present.